Welcome to the Keele Astrophysics Group which is part of the School of Chemical and Physical Sciences and the Faculty of Natural Sciences. The Keele Astrophysics group currently consists of 11 academic staff members, with research interests including star formation and stellar clusters, late stellar evolution, massive stars and their impact on the early universe, the interstellar medium, binary stars, interacting binary stars, and the detection of extra-solar planets. Astrophysics Research Experience Between 8-12 July 2019 the Astrophysics Group at Keele will again be hosting a week-long "Astrophysics Research Experience" at the Lennard-Jones Laboratories.. The project is aimed at students with a keen interest in science, technology or computing that are in years 10, 11 or 12 of their school/college studies and are perhaps thinking of going on to do science at university. The research experience will involve students working in small teams on research projects that utilise data from world-class observatories, such as the NASA Kepler satellite and Keele’s SuperWASP telescopes. Further details can be found at http://bit.ly/astroresexp19. Interested students should complete an application form (that can be found at http://bit.ly/keele_astro_we_application). Applications should be received before 25 February 2019. Student Viktor Zivkov, with Joana Oliveira, won 54 hours on the 4m VISTA telescope in Chile to study stars forming in the Magellanic Clouds. Coel Hellier, with David Anderson and student Lorna Temple, won 8 nights on the 3.6m ESO telescope in Chile to discover planets around hot stars. John Southworth, with Pierre Maxted and Barry Smalley, won 7 nights on the 4.2m William Herschel Telescope in Spain, 2 nights on the 3.6m New Technology Telescope in Chile, and 7 nights on the 1.9m telescope in South Africa to study exoplanets and their hosts; with Maxted and student Sam Gill he won 17 hours on the 2m Liverpool Telescope in Spain to study eclipsing binary stars. Pierre Maxted, with Rob Jeffries, won 13 nights on the Isaac Newton Telescope (INT) in Spain to study tidal interactions between binary solar-type stars. Student Teo Mocnik, with Southworth and Hellier, won access to data from the Kepler spacecraft to study exoplanet systems. Jacco van Loon won 7 hours on the 8.2m Very Large Telescope in Chile against an overbidding factor of 12, to study the remnant of a supernova explosion; with student James Bamber he won 4 nights on the INT to find dying stars in nearby galaxies; and with student Ameerah Al-Sadooni he won 28 hours time on the Southern African Large Telescope (SALT) to study galaxies seen on their sides. Sam Gill, with Smalley, Maxted and student Jessica Kirkby-Kent won 5 hours on SALT to characterise binary stars. Both SALT allocations are at no cost to Keele. 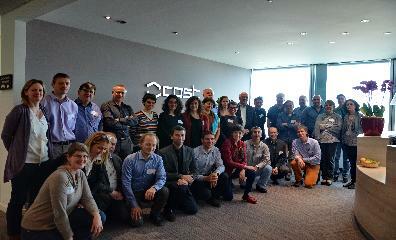 Work has begun in earnest on a European project to investigate the beginnings of the universe. The Chemical Elements as Tracers of the Evolution of the Cosmos (ChETEC) Action is a multidisciplinary, pan-European network to further develop our understanding of the evolution of the universe. The COST-funded Action, which was granted last year, aims to bring together researchers, scientists and businesses from 27 countries in Europe to answer open questions about the early stages of the universe. Dr Raphael Hirschi, Chair of the ChETEC Action and Associate Professor of Astrophysics at Keele University, has just returned to the UK after delivering invited talks at conferences in Italy and Korea, where he introduced the ChETEC Action and presented findings from his ERC-funded SHYNE project. His talks were very well received, with participants at both conferences learning how they could get involved in the ChETEC COST Action. Dr Hirschi is also liaising with the Joint Institute for Nuclear Astrophysics (JINA) in the US, which drives a similar coordination effort in the US in the field of Nuclear Astrophysics. Dr Hirschi commented: "Raising the profile of the ChETEC Action is key to being able to build comprehensive knowledge hubs and also to further coordinate research at the inter-continental level in this challenging cross-disciplinary field of research." The next stage of the Action will be a workshop for all members to attend, to be held at Keele University from 9-11th of October 2017. This workshop will involve all four of the Action’s working groups, who will set-up knowledge hubs and coordinate research activities to answer key open questions such as: "What is the role of neutrinos and their oscillations in supernova explosions and their ejecta composition?" Two training schools for researchers are also planned; in Paris in September 2017, and in Bucharest in April 2018. Dr Hirschi said: "I am very excited about the training schools, where PhD students and researchers will learn state-of-the-art techniques and gain valuable hands-on experience. This is a unique opportunity for many PhD students across Europe, who could not obtain such training at their home institute or even elsewhere in their country. Short-term scientific missions have also started and will boost collaborations across our network." 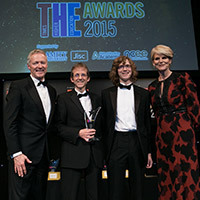 The Astrophysics group's "Stardome", a portable planetarium for schools, developed by Prof Rob Jeffries using funding from the STFC and Keele's alumni fund, won the Times Higher Education Supplement Widening Participation and Outreach initiative of the year award. The 6-m diameter inflatable planetarium is taken to around 35 local schools and 4000 school pupils per year by Prof Jeffries and a team of "Keele student ambassadors". The project is administered by Keele's widening participation team. Pupils learn about the cosmos, stellar evolution, the search for alien life and Keele's role in discovering exoplanetary systems around other stars.